Walking through Le Corbusier's exhibition at the Museum of Modern Art, I was surprised by how many of the great modernist architect's designs were never built. 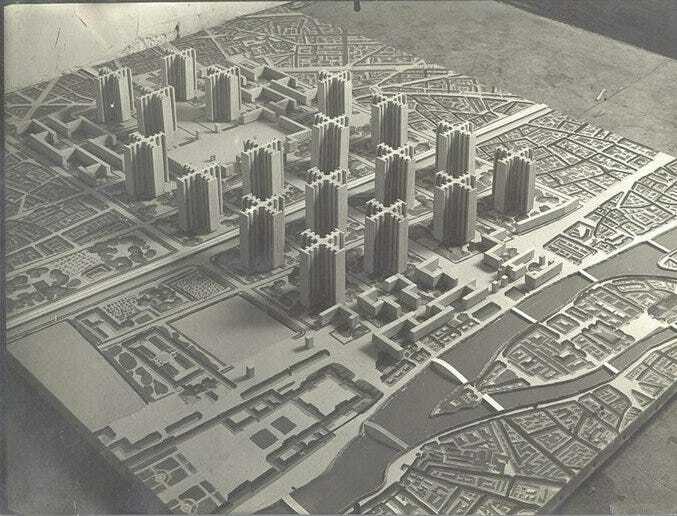 They were simply too radical, and none more so than his 1925 proposal to demolish two square miles of downtown Paris. It's probably a good thing the architect, born Charles-Édouard Jeanneret-Gris, didn't get his hands on Paris. The area he would have destroyed, including the 3rd and 4th arrondissements on the right bank of the Seine, is today among the prettiest, hippest, and most architecturally significant neighborhoods in the city. What's more, the replacement of organic urban areas with huge new developments has been criticized since the 1960s for sapping the vitality of cities. 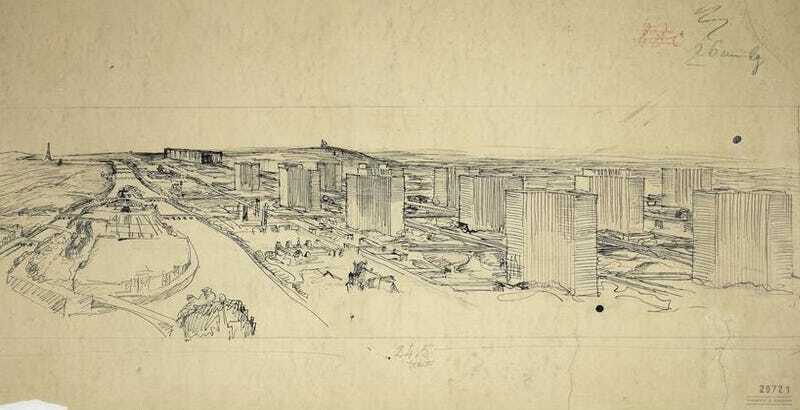 All of that said, let's take a moment to appreciate how cool Le Corbusier's Plan Voisin would have been. 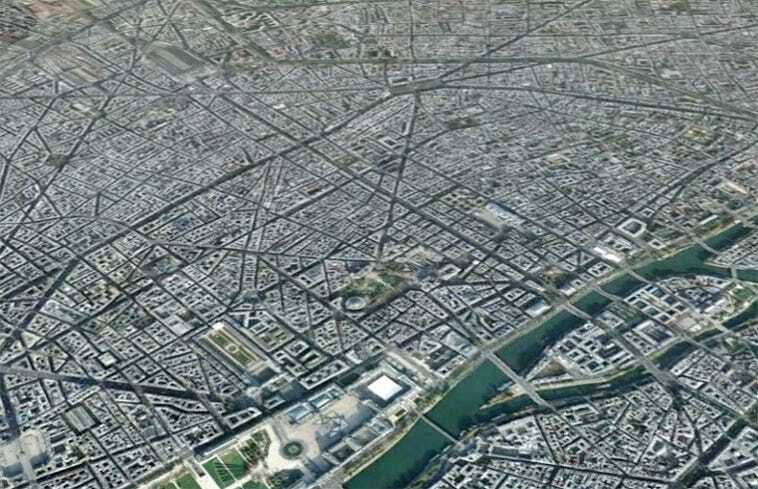 To start, demolishing central Paris made a lot of sense in the 1920s. The formerly aristocratic Marais district had fallen into squalor, characterized by poor sanitation, disease, and overcrowding, as chronicled by Marybeth Shaw in "Promoting An Urban Vision: Le Corbusier and the Plan Voisin." By 1921 in the Beaubourg area, 250 out of 276 houses were marked uninhabitable due to tuberculosis contamination. Le Corbusier wanted to replace this urban blight with something incredible. 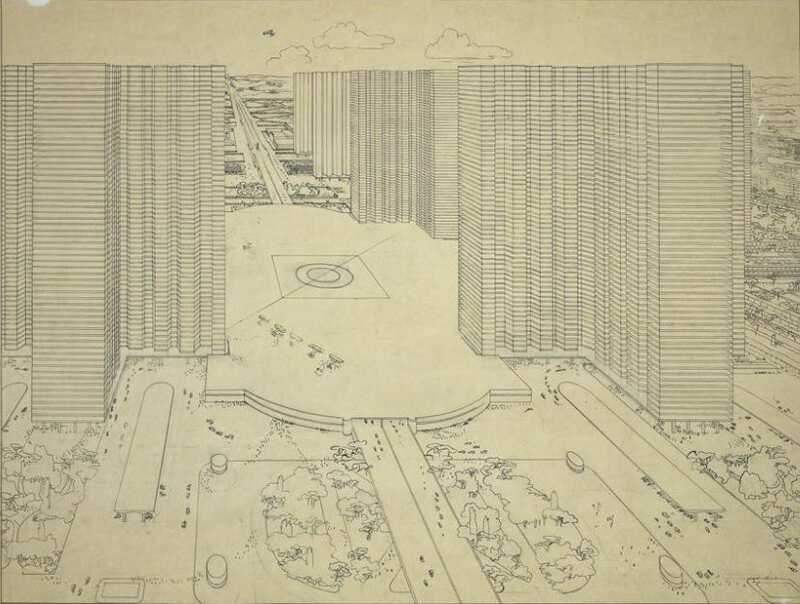 Plan Voisin called for 18 cruciform glass office towers, placed on a rectangular grid in an enormous park-like green space, with triple-tiered pedestrian malls with stepped terraces placed intermittently between them. Extending perpendicularly to the west, there would be an adjacent rectangle of low-rise residential, governmental, and cultural buildings amid more green space. The new development would be integrated with highways, train and subway lines, as well as an airport, making this area the first thing that most visitors to the city would see. I shall ask my readers to imagine they are walking in this new city, and have begun to acclimatize themselves to its untraditional advantages. You are under the shade of trees, vast lawns spread all round you. The air is clear and pure; there is hardly any noise. What, you cannot see where the buildings are ? Look through the charmingly diapered arabesques of branches out into the sky towards those widely-spaced crystal towers which soar higher than any pinnacle on earth. These translucent prisms that seem to float in the air without anchorage to the ground - flashing in summer sunshine, softly gleaming under grey winter skies, magically glittering at nightfall - are huge blocks of offices. Beneath each is an underground station (which gives the measure of the interval between them). Since this City has three or four times the density of our existing cities, the distances to be transversed in it (as also the resultant fatigue) are three or four times less. For only 5-10 per cent of the surface area of its business centre is built over. That is why you find yourselves walking among spacious parks remote from the busy hum of the autostrada. The new office district would be the business center of the city, the country, and the world — while looking nothing like the "appalling nightmare" downtown streets of New York City. The adjacent housing district would be home to the world's business elite. "Paris of tomorrow could be magnificently equal to the march of events that is day by day bringing us ever nearer to the dawn of a new social contract," Le Corbusier wrote. To pay for the project, Le Corbusier counted on investment from France's business elite, promising a five-fold increase in land value. As for the denizens of the area that he wanted to destroy, the architect said these "troglodytes" could be relocated to garden cities in outer Paris. As for concerns with leveling such a historic neighborhood, Le Corbusier insisted that the best architecture from the district — including the Palais Royal, the Place des Vosges, and certain townhouses and churches — would be saved. They would be, as described by Shaw, "preserved like museum pieces in the green carpet of the skyscrapers and low-rises that one would come upon while walking the curved paths of the parks." © 2013 Artists Rights Society (ARS), New York / ADAGP, Paris / F.L.C. 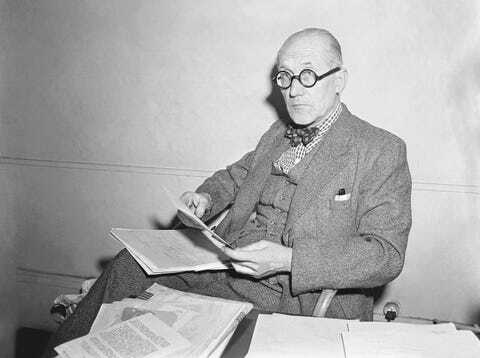 Editor's Note: Would Paris be "Paris" if Le Corbusier succeeded in his plans? Even Hitler knew better than not to destroy Paris during the occupation/retreat during World War II. The monstrous conceit of "Smart Growth" planners of Plan Bay Area is that they can build a "better Marin" by creating transit oriented development prescribed by a national institue of planning professionals. We even have "style guides" for architecture that will help builders expedite construction. Goodbye to architectural innovation, nuance and whimsy. If successful, we will be left with a soulless landscape much like Le Corbusiers Vision. We will not let this happen. We will Save Marin Again!